Nahwegaabo kwe ndizhnikaaz, waabizhayshee ndodem, Nipissing ndoonjibaa, bezhig mide kwe indow miinwa Anishinabekwe indow. 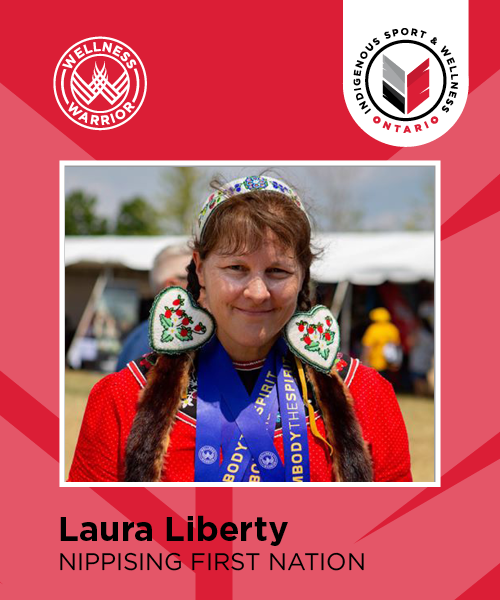 My English name is Laura Liberty I belong to the Marten clan, I am from Nipissing First Nation, I am first degree Midewiwin and Anishinaabe. I am the proud mom of a teenage son named Shkaabewis Tabobondung. After high school athletics I competed for two years in powerlifting, my career best was 6th at the World Powerlifting Championships in 1988. I also enjoyed competitive kayaking for three summers. My highlight was paddling to national gold with the ladies senior war canoe in 1987. I graduated from Advanced Coaching techniques in Gymnastics a 2 years college program at Seneca, Sports injury management a 3-year college program at Sheridan, 1 year of teachers college Aboriginal Teaching Certificate program at Nipissing University. I retired as a provincial competitive gymnastics coach after 25 years and took a position with the Anishinabek nation health department where I have been for 10 years. Currently, I am the HIV coordinator. I was overweight, out of shape, and inactive cheering on my son from the sidelines for his triple gold medal performance in kayaking at NAIG 2016. He inspired me to make a commitment to myself and get active so I was really excited to see the Masters Indigenous Games postcard a month later. I knew I would be taking part in some capacity I just didn’t know what sport. I trained for a year to prepare for the marathon paddling at miG and won two bronze and one silver. I’m happy to share despite double mastectomy for breast cancer 10 years ago I’m still going strong. I am currently training in the gym to tie or beat the national bench press record of 75 kg for the 161 lb weight class in the masters 2 (I’m 53 and proud of it!) age category. Now that I’ve broadcasted here I have to stick to it! Sport plays a key role as I continue to improve my fitness I’m able to do more. Thankfully I have the option to shape my days around sporting activities. Weekends it’s top priority on a good day I get to bike rollerblade and paddle! I especially enjoy outdoor activities!